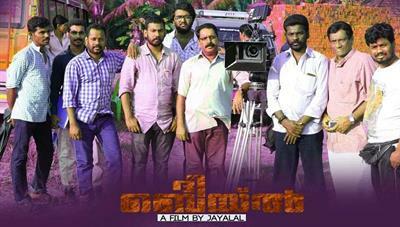 The Bail malayalam movie directed by Jayalal featuring Sreejith Ravi, Chembil Ashokan and Ammu in lead roles. Fasal Backer, Colin Paul and Vijayan Chathanoor will give life to other prominent characters in the movie. 'The Bail' is produced by Sindhu Raj under the banner Shivadurga productions. Scripted by Vishwambaran Mundathikodu, the camera is handled by Unni Karathu. Read more to know about The Bail. After taking rave reviews for his maiden project 'Dhanyam', filmmaker Jayalal is ready with his next movie which tell the tale how youngster who fall prey to social evils. Titled 'The Bail', the movie scripted by Vishwambaran Mundathikodu zooms into the life of the young generation and their misdeeds. Suraj and Kiran are very thick friends. Suraj's father is a drunkard who lives his life without taking care of his family. Due to his irregular behaviour, his wife falls in love with an auto driver. On the other side Suraj finds hard to find money for his studies. Meanwhile Kiran's father was a businessman whose mind who kept his time thinking about the growth of his big business. His wife found happiness loving after her pet dog. Kiran too found hard to gather money for his basic needs. Even though Suraj and Kiran wished to live a trendy lifestyle, lack of money kept them away from their friends. They started thinking some shortcuts to gather money to lead a luxurious life. Finally, they meet K V, a business person who showed a way to make money. Known as a popular business magnet, K V had been following some perilous activities to develop his empire. He used the physical and mental power of both the friends to do some mischievous deeds. Rest of the story zooms into an unpredictable stage which would keep the audience intact. Fasal Becker and Colin Paul give life to Suraj and Kiran respectively. Sreejith Ravi would don the role of Inspector Lakshmi Narayanan, an investigative officer. Chembil Ashokan will be seen as K V. Ammu who had played a prominent role in the movie 'Swapnasanjari Gramam' is also in the star cast. 'The Bail' is produced by Sindhu Raj under the banner Shivadurga productions. The camera of the movie is being helmed by Unni Karathu. After the post production jobs, 'The Bail' would reach theatres very soon.